This week’s theme includes outdoor dining and entertainment products, gardening supplies, clothing and footwear, pet supplies, and kitchen items. Plus, of course, some food. Gardenline Outdoor Gas Fire Table, $129.99. This measures 30″ x 30″ x 24.21″ and is fueled by a standard 20-lb. propane tank. 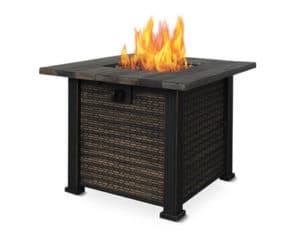 It has a 50,000 BTU heat output and includes a durable steel base, Envirostone faux wood tabletop, burner lid, lava rocks, and protective cover. It also has a hidden control panel with integrated ignition. Gardenline Slat Back Chair, $19.99. This has a weight limit of 250 pounds, is made of steel with a powder-coated finish, and is stackable. Gardenline Umbrella Side Table, $29.99. This goes with the Gardenline Slat Back Chairs and measures 21.6″ x 21.6″ x 18.7″. 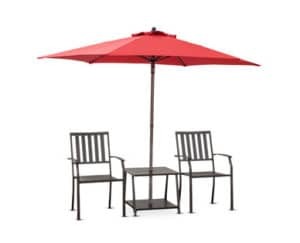 Gardenline 7.5′ Umbrella, $19.99 to put in the side table. This comes in assorted colors and has an easy open push-up lift style. Gardenline Premium Seat Cushion, $19.99. Designed to fit on the Slat Back Chair, but can also be separate. Measures 19.25″ x 18″ x 4.5″, comes in two-tone Light Blue or Solid Red. Weather-resistant, fade-resistant fabric, filled with polyester fiber. Nonallergenic. Gardenline Outdoor Pouf, $19.99. This measures 18″ x 18″ x 13″ and comes in assorted styles. It’s made of 100% polyester. Gardenline Outdoor Toss Pillow, $6.99. Various sizes and dimensions. Weather-resistant, UV treated to resist fading; nonallergenic fiber, filled with polyester for long-lasting comfort. Huntington Home 5′ W x 8′ L Indoor/Outdoor Rug, $39.99. Assorted varieties. Intex 12′ W x 30″ D Above Ground Pool, $89.99. Chances are you’ve seen these pools at your local hardware or big-box store. The Aldi version appears to be about $10 cheaper than the list price at most other places we’ve seen. Gardenline 12′ Hammock with Stand, $69.99. Measures 141.73″ x 47.24″ x 51.18″ with a 275-lb. weight capacity. Gardenline Beverage Stake Assortment, $2.49. For holding your beer or wine glass. 30 inches tall. Crane Portable Soccer Goal, $19.99. Measures 8′ 10″ x 4′ 11″ x 4′ 11″. Includes 1 goal, 1 PE net with sleeve, 1 set of fiberglass poles, 4 ground pegs, and 1 carry bag to carry everything. Crane Bean Bag Toss, $29.99. Includes two 36″ L x 24″ W target boards, eight bean bags (4 blue, 4 gray), a carry bag, and instructions. You can also buy the Bean Bag Set separately for $6.99. Little Journey Pop-up Playpen, $59.99. Includes playpen, canopy and carry bag. Assorted colors. Gardenline 50′ Garden Hose, $9.99. You can also pick up a Gardenline Hose Hanger for $7.99. Gardenline Watering Wand, $4.99. Comes in two varieties: a 33″ shower watering wand and an 18″ pattern watering wand. These appear to be made by Ray Padula; you can read our impressions of the company’s rebranded Aldi hose nozzle here. Serra women’s clothes. They include Capri or Bermuda Jeggings for $8.99, Embroidered Tops for $9.99, Pajama Short Sets for $9.99, and Sandals for $7.99. Royal Class Men’s Sandals, $7.99. Lily and Dan Children’s Clogs, $4.99. Heart to Tail Pet Grooming Kit, $19.99. Comes with several tools, including a clipper with a 70-inch power cord and various blades, as well as a brush, nail cutter, and hair pad. Heart to Tail Hard Sided Pet Carrier, $19.99. Measures 18″ x 25″ x 16″ and can carry up to 25 pounds. Meets IATA and USDA air travel requirements. A Heart to Tail Multipurpose Pet Mat for $9.99 or a Heart to Tail Round or Rectangle Small Pet Bed for $8.99. Ambiano 3-Cup Food Processor, $14.99. Can chop, shred, slice, grate, or puree. Features a stainless steel blade, quick-lock lid, built in feed tube, and two speed settings. Ambiano Milkshake Maker, $19.99. This has a 12-ounce capacity, 2 speed settings, tilting head, removable stainless steel mixing shaft, stainless steel mixing cup, and nonskid feet. Crofton Silicone Suction Lids, $4.99. These appear to be an alternative to disposable clear wrap or foil, providing an airtight seal and acting as a splashguard. They’re dishwasher and microwave safe and available in three sizes. Crofton Pineapple Slicer, $3.99. Dual action stainless steel blades are good for 3- to 5-pound pineappples. This is dishwasher safe and comes in assorted colors. Crofton Cherry Pitter or Strawberry Huller, $3.99. The pitter removes cherry or olive pits, while the huller removes strawberry stems. Crofton Carry-All Containers, $3.99. Choose from salad, round, and rectangle carriers. Crofton Colored Fry Pan Set or 12″ Fry Pan, $10.99. Features Whitford Xylan Plus nonstick coating and comes with a 2-year warranty. Clancy’s Cinnamon Churros, $0.99. They’re not quite up to par with Taco Bell churros, but if you’re looking for a cheap churro fix, they’re worth a look. Bremer Gyros Kit, $6.99. These are outstanding and we stock up on them every time they’re in stores. Everything you need to make them comes in the box. Fresh 73% Lean Ground Beef, $1.99 per pound. Fresh USDA Choice Twin Pack Boneless Beef Ribeye Steaks, $7.99 per pound. You can read our thoughts on Aldi ribeyes here. Ambiano, Bremer, Clancy's, Crane, Crofton, Gardenline, Heart to Tail, Huntington Home, Intex, Lily and Dan, Little Journey, Royal Class, Serra. Bookmark. I just purchased the Gardenline Outdoor Gas Fire Table and I am more than pleased! My Local Aldi had it marked down to $90.99. It took about an hour to assemble and works perfectly. Some of the holes for the screws are not quite lined up perfectly but the screws will fit. As with anything assembled at home, do not tighten any of the screws until they are all installed. Leaving them loose aids in making sure all of the bolts can be installed and in squaring it. Just snug them and finish tightening after the table is square and the door fits correctly. Then install the top according to the directions. This fire table will rival any of the more expensive fire tables and has a two year guarantee. I highly recommend it to anyone looking for a fire table that won’t break their bank account.